Tiana, Isabell, Lauri and Demi support the front office of our hospital. 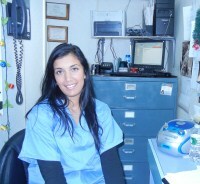 In addition to answering phones and performing clerical work, they are happy to answer questions and make your visit to the Animal Clinic of Bay Ridge as stress free as possible. They can answer questions and help with medication refills or drop off of samples for lab tests. If you need to leave a message for a doctor or have questions or concerns they are happy to help! Julio is our main technician. In addition to assisting the doctors in the exam room and with treatments, he takes radiographs, obtains laboratory samples, places IV catheters and ensures that our patients are well fed and comfortable. 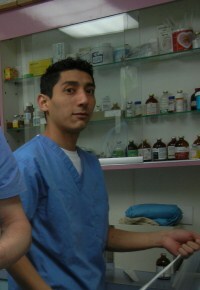 Dave is our surgical technician. He assists Dr. Alexandru in surgery and is responsible for maintaining our surgical equipment as well as monitoring our patients during surgery with our EKG, pulse oximeter, and blood pressure machines. Miguel is our newest assistant and his love for animals is apparent as he assists Julio, Dave and the doctors in the care of our patients.